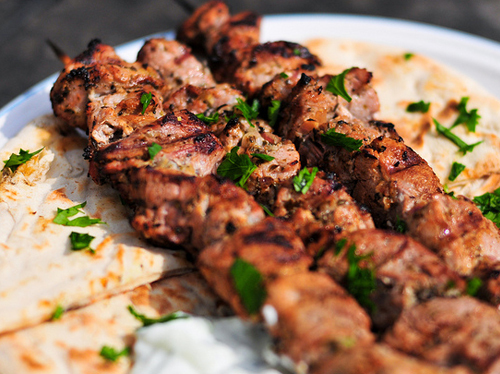 In Greece when we want to eat something quick and tasty, we almost always refer to souvlaki: pork meat chopped in small pieces, grilled, usually flavored with tzatziki is the “all time classic”!! Make it at home with chicken, . But can be eaten and how … alternative, dare to make at home with chicken, calf meat, vegetables or fish. We give you the traditional, classical recipe. Cut the pork into bites. In a large bowl, place the meat, and add the oil, the tomato, the peppers onion. Add salt, pepper, the garlic and the Send-A-Scent Aromatic Cretan Savory. Mix well and leave in the refrigerator overnight. The next day cross the meat on skewers for barbecue. Inbetween the pieces of meet, add peppers, onions and tomato. Barbeque or cook on the grill. Add some lemon to taste. At the end grill the pita-pies. Serve the souvlaki with the pita-pies (optionally add chopped onion, tomato, tzatziki in the plate) and enjoy a unique Greek meal. Buon appetite!! Or as the Greeks say: Kali orexi! !